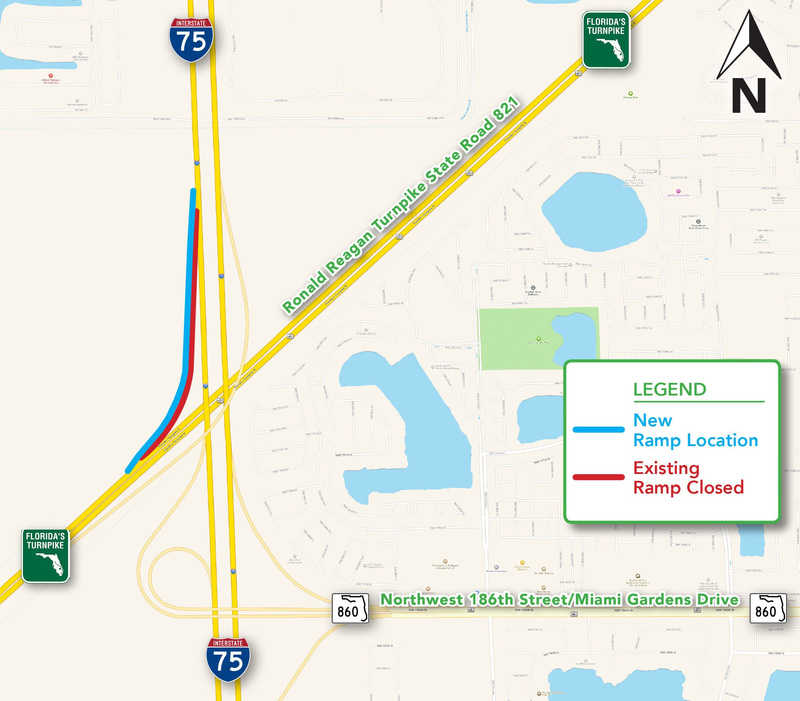 Beginning Thursday night, June 30, the ramp from southbound I-75 (Exit 5) to southbound Florida’s Turnpike will shift to its new location. The new ramp will shift slightly west of the existing ramp and remain two lanes. If crews are unable to complete the work due to inclement weather or other unexpected conditions the traffic shift will occur on Tuesday, July 5. To download a detour map please click here. This entry was posted in News on June 29, 2016 by Realty Services Florida. • All lanes of I-75 southbound at Sheridan Street will be closed from 11 p.m.Wednesday, June 29 to 5 a.m. Thursday, June 30. 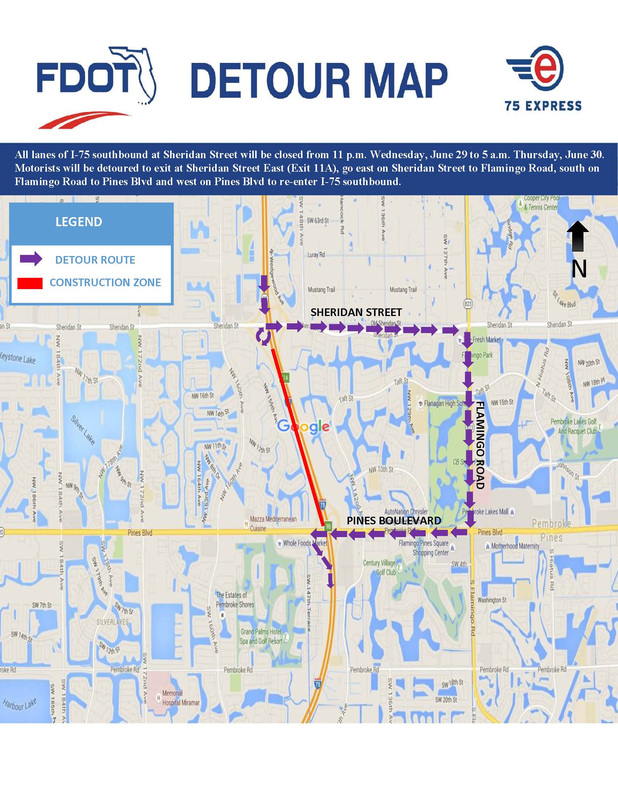 Motorists will be detoured to exit at Sheridan Street East (Exit 11A), go east on Sheridan Street to Flamingo Road, south on Flamingo Road to Pines Blvd and west on Pines Blvd to re-enter I-75 southbound. Please follow the posted detour. • If necessary to complete the work, these lane closures will also take place from 11 p.m.Thursday, June 30 to 5 a.m. Friday, July 1. This entry was posted in News on June 28, 2016 by Realty Services Florida. 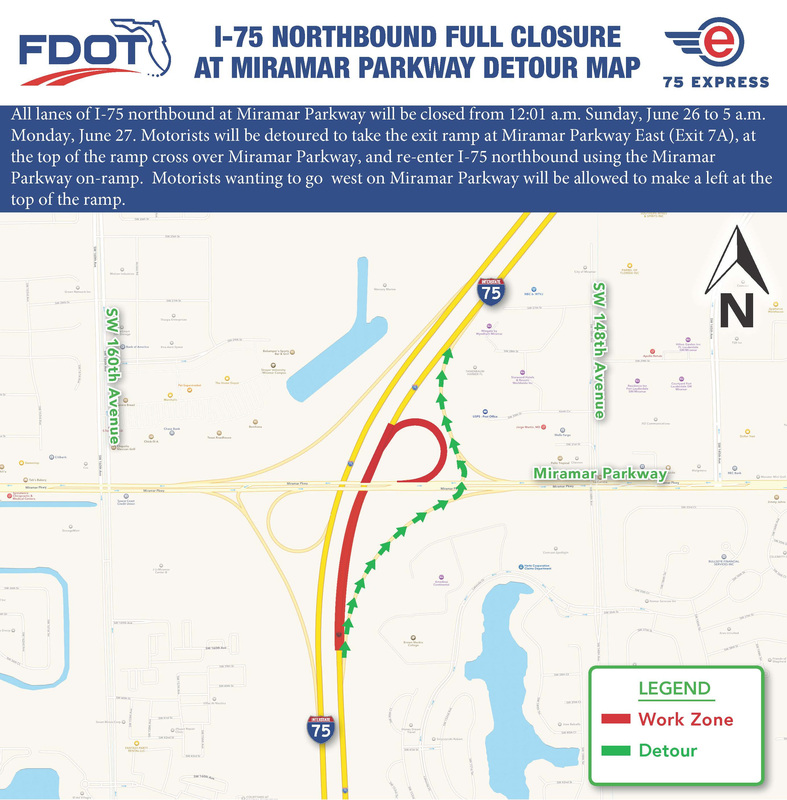 All lanes of I-75 northbound at Miramar Parkway will be closed from 12:01 a.m. Sunday, June 26 to 5 a.m. Monday, June 27. 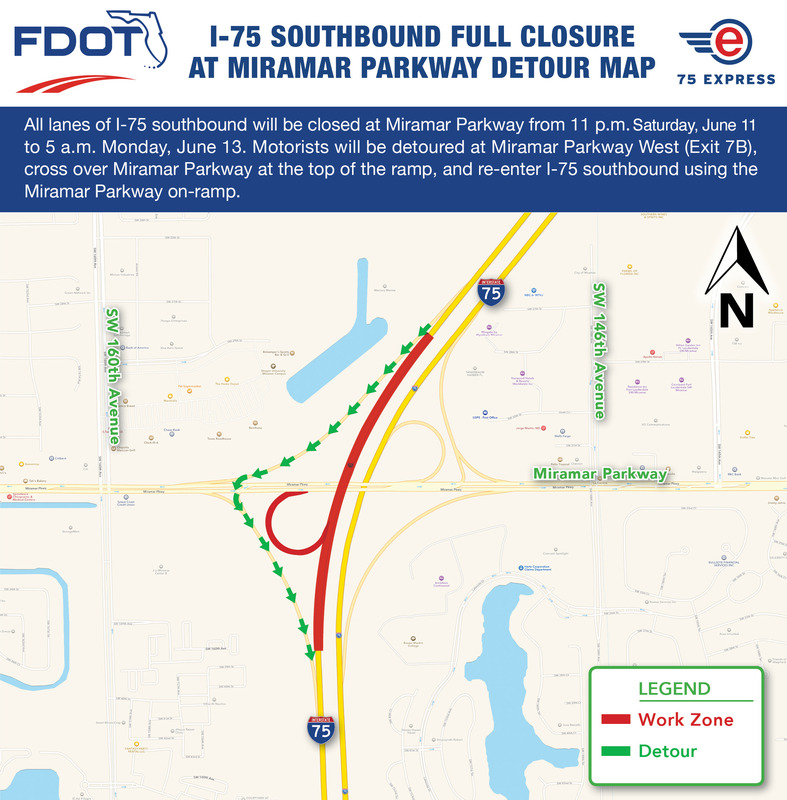 Motorists will be detoured to take the exit ramp at Miramar Parkway East (Exit 7A), at the top of the ramp cross over Miramar Parkway, and re-enter I-75 northbound using the Miramar Parkway on-ramp. Motorists wanting to go west on Miramar Parkway will be allowed to make a left at the top of the ramp. This entry was posted in News on June 24, 2016 by Realty Services Florida. This entry was posted in News on June 13, 2016 by Realty Services Florida. 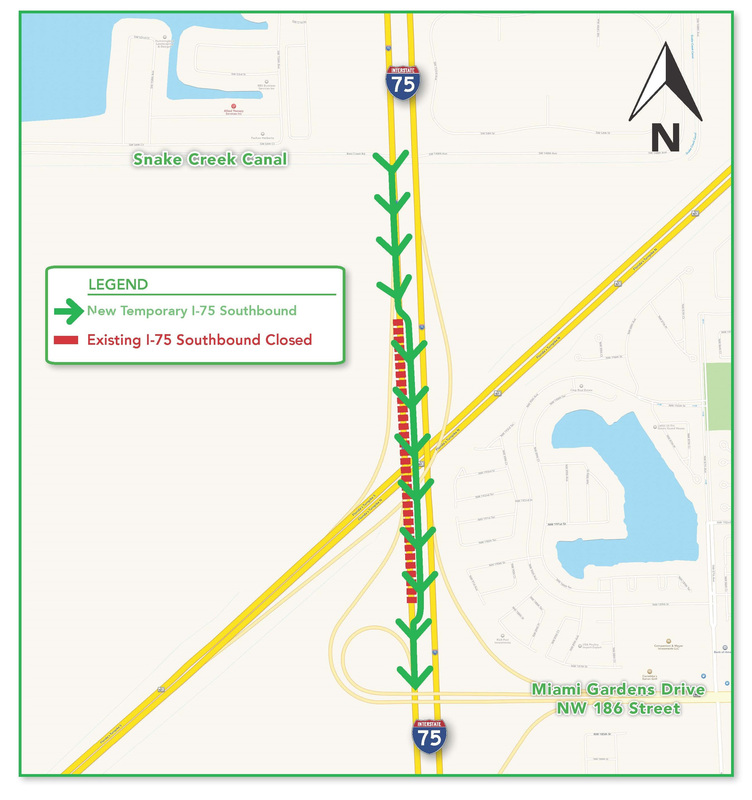 Beginning Tuesday night, June 7, the Florida Department of Transportation (FDOT) is scheduled to shift southbound traffic towards the median on I-75 from south of the Snake Creek Canal to Miami Gardens Drive. This work will allow crews to construct the new direct connect bridges between 75 Express lanes and Florida’s Turnpike as well as southbound I-75 lanes. This configuration will remain until the end of the year. This entry was posted in News on June 8, 2016 by Realty Services Florida. The Florida Department of Transportation (FDOT) is scheduled to shift southbound traffic on I-75 from south of the Snake Creek Canal to Miami Gardens Drive to construct the new permanent lanes of southbound I-75 and direct connect bridges between the future 75 Express lanes and Florida’s Turnpike. Beginning Monday night, June 6, all southbound lanes of I-75 will be shifted to the median and will remain in this configuration until the end of the year. This entry was posted in News on June 3, 2016 by Realty Services Florida.